Disregard the fields asking you for a username and password. Your RGU details will not work here. Instead, look for the link below this section, called 'My Institution's Credentials (Shibboleth)'. Click here and you will see a drop-down menu appearing, with a long list of universities. From the list, select 'Robert Gordon University'. 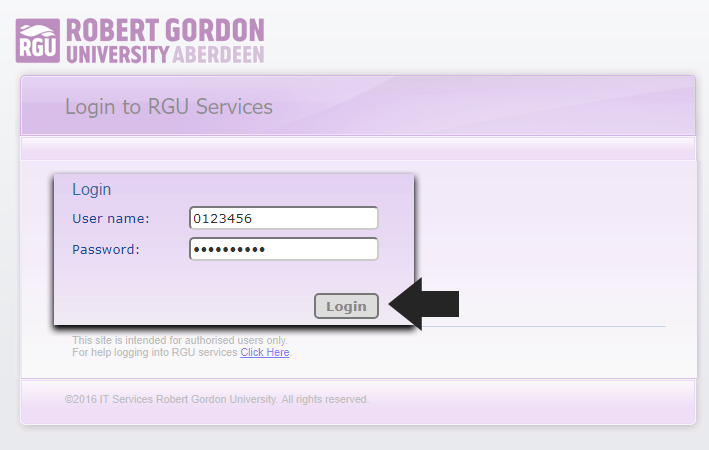 The familiar purple RGU log-in window should appear now. Here you should insert your RGU username and password. These will be the same details as the ones you're using the log-in to CampusMoodle. If you already have references in your collection, they will appear here. Otherwise, you will be welcomed by an emptier looking screen. Time to add some references in! If you don't want to add the details of books manually, or want to upload multiple books' details at once, it's easy to pull this information directly from our RGU Library collection. From the grey menu located at the top of the screen, select Search. A drop-down list will appear, and the option you should be looking for is Online Catalogue or Database. There are a few choices to make here. 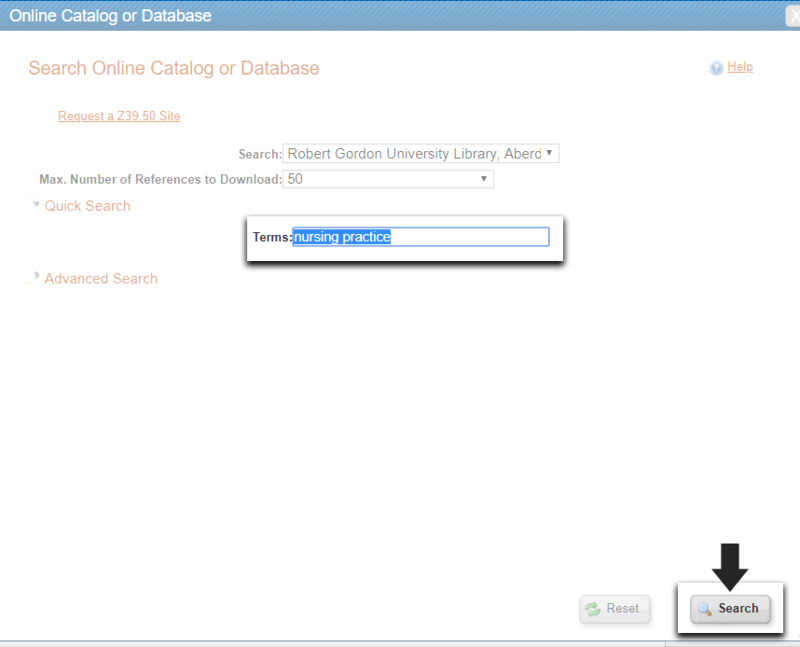 Firstly, notice the drop-down menu next to Search; by default, this should display PubMed. 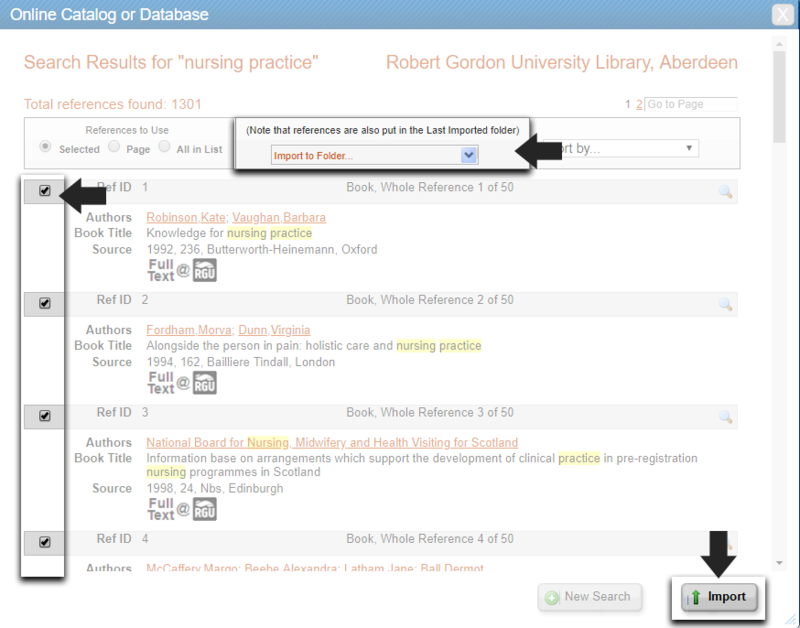 Click on the down-arrow to expand the list of catalogues you can choose from, and search for Robert Gordon University Library, Aberdeen. Once you find us, click to select this option. 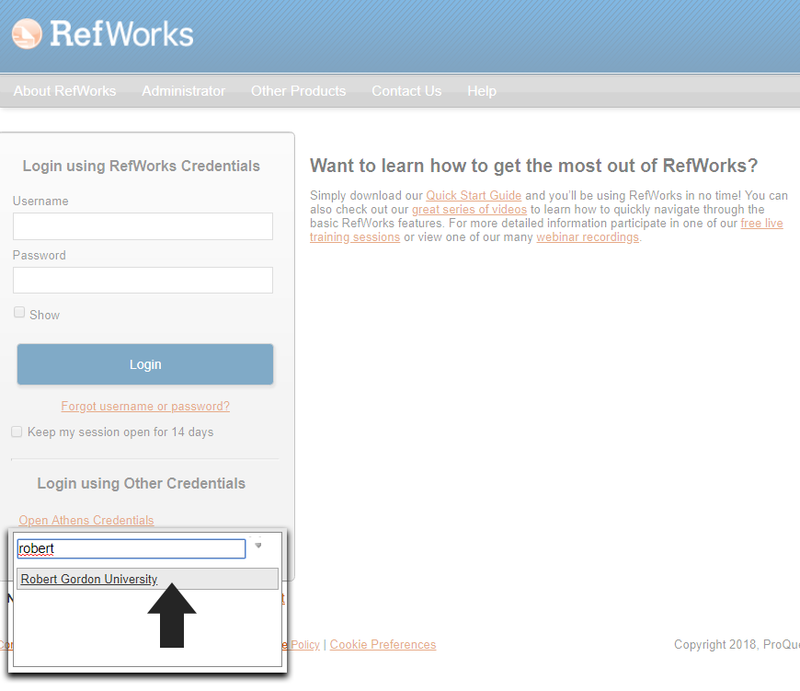 You can also choose how many results RefWorks should retrieve based on the keywords you will enter. It's 50 by default. Type in some relevant keywords to describe the topic you are researching. If you already have a book from our collections, you can search specifically for the title, and the book details will be retrieved. Once you are happy with your search terms, hit Search. Have a look through the list of results and tick the checkbox next to the books which you would like to add to your collection. You can either add these to a folder (if you don't have a folder already, you can create a new one after you click on Import to folder...), or simply click Import, and your references will be added to a default folder called Last Imported. You'll be asked to confirm the import of the selected books. 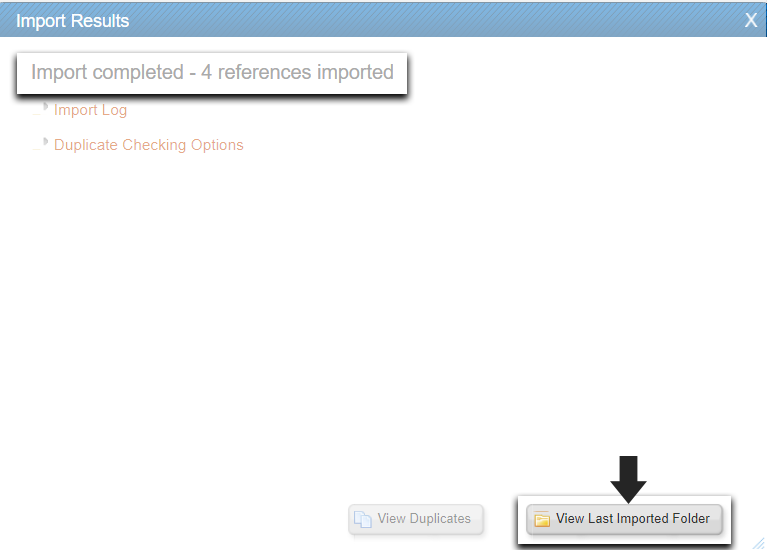 Hit OK.
Once you get the Import completed message, you can click on View Last Imported Folder to see them. 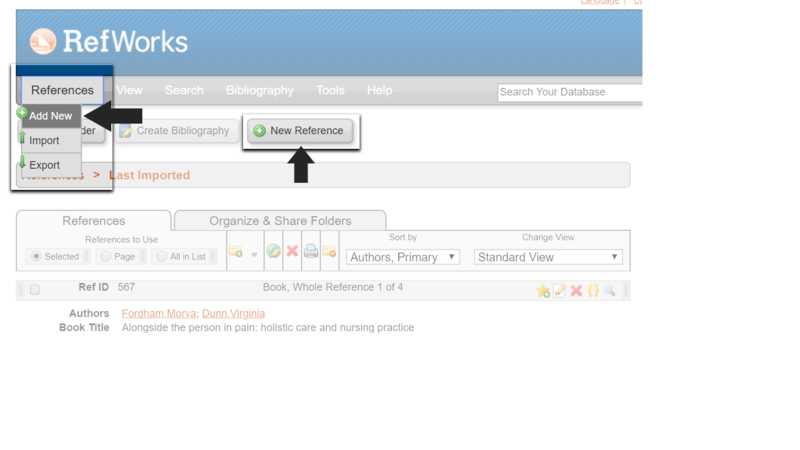 You can either hover over the References option located on the grey menu bar at the top of the screen, then click Add New or simply hit the New Reference button. There are a few things to fill in here. 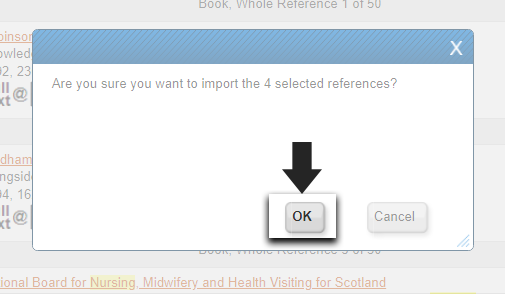 Firstly, make sure you select the correct RGU recommended referencing style. This could be either Harvard or Vancouver. Then, select the type of material from the drop-down menu. You will notice that depending on the type of material you selected, the fields required change. 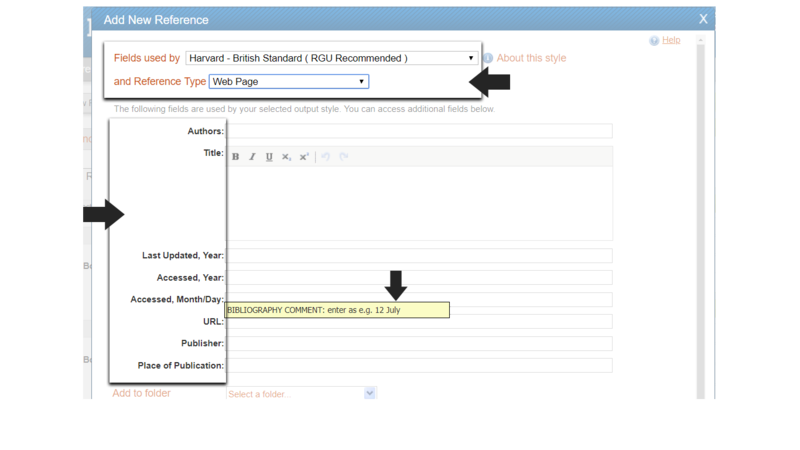 For example, a webpage reference will ask for a URL and an Accessed date, whereas a journal article will ask for volume and issue numbers. Start filling in the fields with the information you have about the source. If you are unsure, hover over the name of the field and a yellow box will appear, explaining what should go in the field and in what format. Don't forget to Save Reference. You can close this box afterwards. The reference should now appear in your collection, just as in this example. 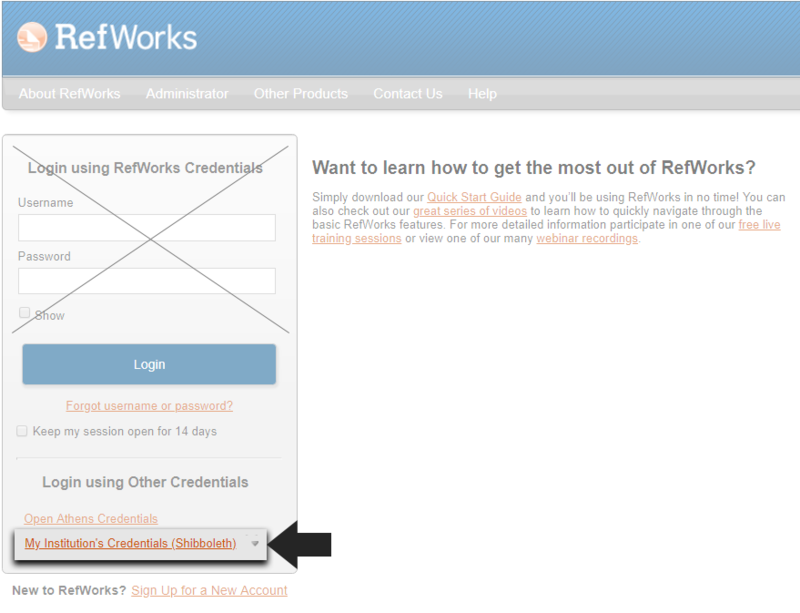 Notice at the top how RefWorks indicates it is a Webpage Reference?